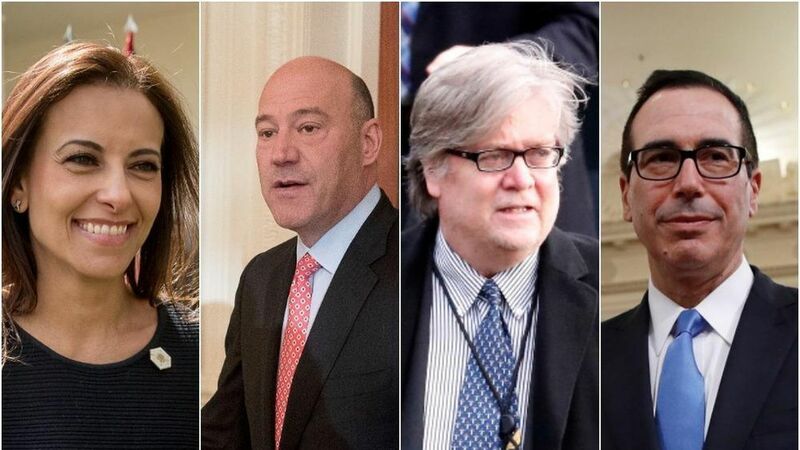 There are four former Goldman Sachs execs helping out in Trump's White House in pretty prominent positions: Gary Cohn, Steve Mnuchin, Dina Powell, and Steve Bannon. Though they all share a Wall Street background, a new Vanity Fair piece reveals the internal conflicts among these bank-execs-turned-White-House-officials, and how their experience at Goldman might influence the way they approach their roles. The best part: the candid quotes from former Goldman colleagues who arguably know these four better than most. The money quote: "I don't think [Steve] Bannon has jack sh*t of a Goldman Sachs pedigree," one former Goldman Sachs partner told VF's William Cohan. Bottom line: These four have one very important thing in common that likely drew Trump's attention: money. "Trump likes alpha males that...have made a lot of money," one former Goldman partner said. This report gives one of the most thorough inside accounts of these key WH players and provides insight into what we can expect from the Trump admin moving forward. A former Goldman partner explained to Cohan why he though Gary Cohn, a lifelong Democrat, would accept the offer to join Trump's WH staff: "This was an incredibly sort of convenient and opportune kind of thing that came along for Gary because—whether he was going to Washington or not—Gary was out." Cohn reportedly became "overconfident" in his role at Goldman when he was filling in for his boss, who was undergoing lymphoma treatment, in 2015. He approached various board members about making him CEO of the company during this time, but it didn't work out — "there was a lot of loyalty" to Cohn's boss at Goldman. Other Goldman colleagues dispute this account, saying that instead of making "power plays" for CEO, Cohn simply started hearing out the other offers coming his way, which included one from POTUS. His WH role: A former Goldman partner who still talks with Cohn told VF that Cohn is "dedicated to making sure the U.S. doesn't start any ridiculous trade wars or do something 'crazy' on health care." "I think Steve Mnuchin's homework is being checked by Gary Cohn," a former Goldman partner told VF. A Washington insider told Cohan about the friction between Cohn and Mnuchin, saying Mnuchin seems "insecure in his role." "[Now] he's going around with ... Trump -like guys, which is really different than [who he was], which was a bit socially awkward, very smart, really into teamwork. I would have sworn he was a Democrat—a liberal Democrat." Bannon isn't considered part of the Goldman Sachs crew at the White House, in part because he only spent four years there. "What was unusual about him was he was a huge patriot and kept thinking the country was going to hell. He was really concerned about the United States of America. But I was never quite sure what he thought was wrong it. ...He was never quite able to articulate it in a way that I understood." Powell is one of the WH Goldman members who's seen an almost meteoric rise. She's credited as the person responsible for Trump's relatively successful Middle East trip. "Unlike the rest of us, she has prior White House experience, and she really knows how this place works," a Washington insider said.